One of the most difficult things for a law enforcement agency to determine in regards to using social media is identifying content to post and share with their followers. There is an easy solution for that – just ask. #TalkingTuesday is a theme our agency has used on Twitter to find out what our agency’s followers are looking for. The best part about #TalkingTuesday is that it’s a win/win situation. Our followers love the fun interaction with a police department and we get to find out what they are looking to hear about from us. What is #TalkingTuesday? I thought you’d never ask. 1) Increase the transparency of participating law enforcement agencies. 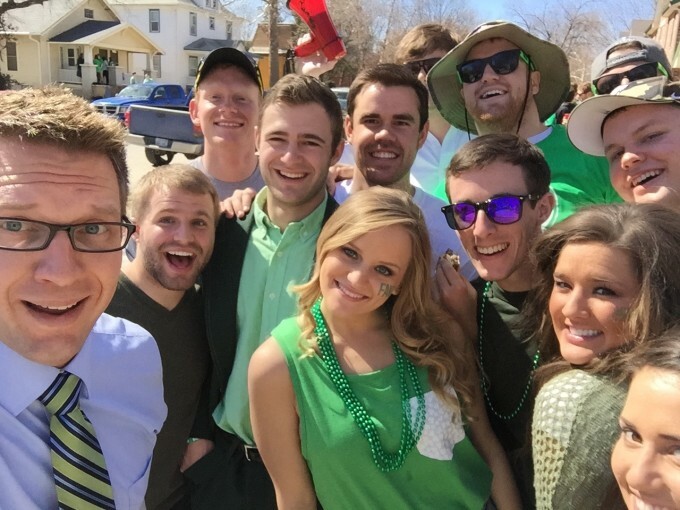 2) Promote positive, fun interaction with our followers on Twitter. 3) Increase the followership on our agencies Twitter pages. 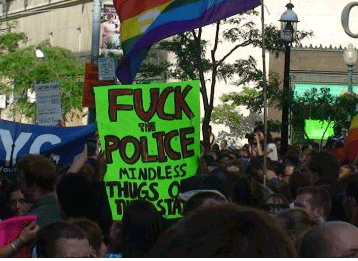 4) Show the public that law enforcement officers are fun, normal people like everyone else. There is a ton of value in law enforcement agencies using social media as a tool to interact and engage with their community members. 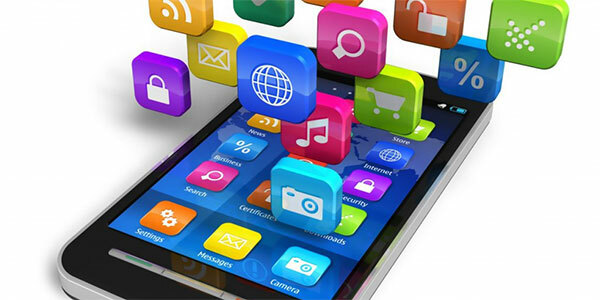 There is also incredible value in using social media as an investigative tool. Law enforcement agencies have experienced a lot of success in identifying subjects of crimes by requesting information on social media. That success is directly attributed to law enforcement agencies having a large enough base of followers to spread the information to. The more followers you have, the more likely you are to receive the information you are looking for. 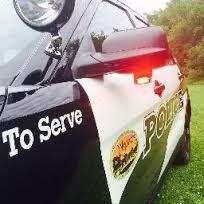 #TalkingTuesday is beginning to catch on with other agencies throughout the country. Join us on May 17th as we roll out another edition of #TalkingTuesday, with agencies from Minnesota, Massachusetts and Virginia participating. 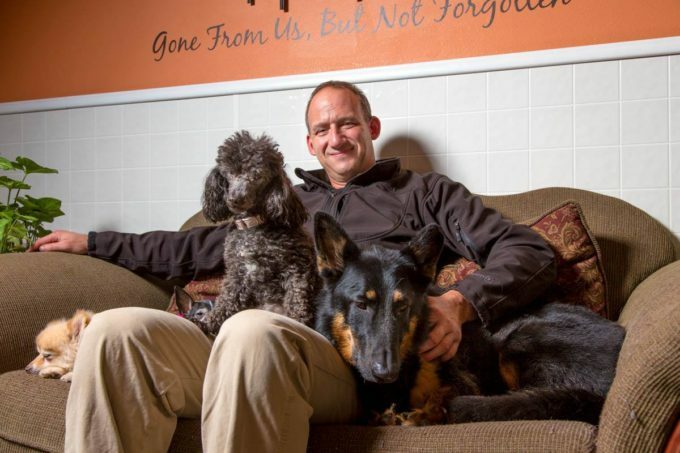 Tony Zerwas is a Police Officer with the Wyoming Public Safety Department. You can contact the author via email at tzerwas@wyomingmn.org if you have any questions about #TalkingTuesday. It had the ingredients for a traffic disaster: a Monday evening rush hour on the notoriously clogged Capital Beltway combined with a 7:05 pm kick-off for the Washington Redskins’ 2013 season home opener in Landover, Maryland. But the Prince George’s County Police Department, whose headquarters borders FedEx Field, home of the Redskins’ stadium, decided to tackle the traffic challenge head-on. The department’s Media Relations Division developed a plan to inform the community about one of the most talked about topics in the Washington, DC area on any day of the year: traffic. 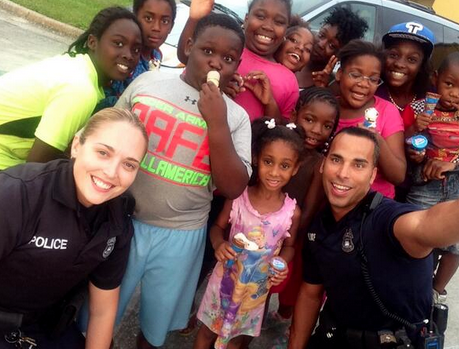 The PGPD created “Game Time,” an information-sharing social media event. The department began tweeting on the Friday before the Monday Night Football game against the Redskins’ nearby NFC East rival the Philadelphia Eagles. 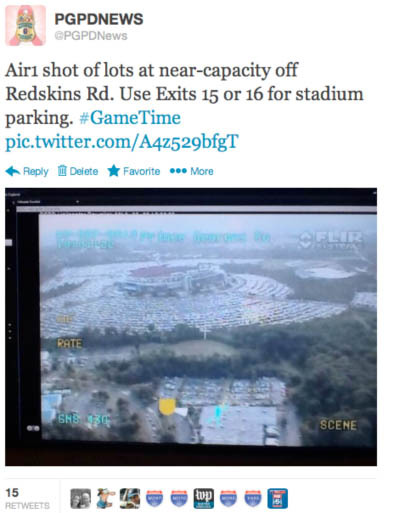 Using the hashtag #GameTime, one member of the Media Relations Division coordinated with the police department’s Special Operations Division, which oversees all events at FedEx Field, to determine which information and images to tweet and when. NFL games are major events for the PGPD with some 200 officers handling security and traffic. There is a large control room within FedEx Field where the Special Ops commanders keep a watchful eye on activities both in and around the stadium. Relying on a large bank of traffic cameras surveying the major arteries near the 90,000-person stadium, the Media Relations Division was able to see and then share traffic news in real time as the 7:05pm kickoff approached. 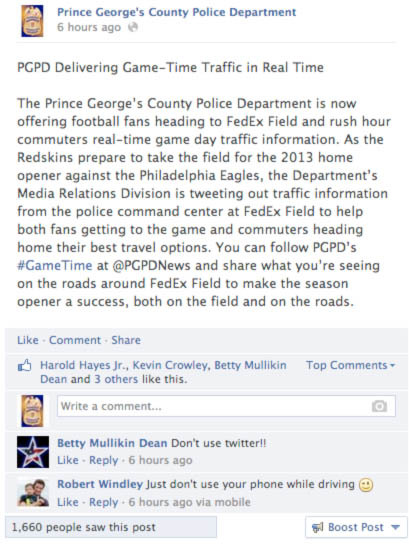 Various local media outlets gave advance coverage to “Game Time”, advising viewers, listeners and reader that the police department’s Twitter handle, @PGPDNews, would be tweeting traffic news during the potentially disastrous evening commute. This included the widely-followed The Washington Post’s traffic Twitter handle, @DrGridlock. A parking logistics coordinator working for the Washington Redskins noted during the event it seemed to him the advance media coverage and the possibility of gridlock might be having an effect – not just on game attendees but on rush hour commuters as well. The parking lots, both he and police commanders noted, were filling up much earlier than expected. The major roadways were far less congested than expected as kick-off neared. Drivers had planned ahead and arrived at the stadium well in advance. A PGPD Special Operations Division helicopter flying above the stadium offered aerial images of traffic and the parking lots. Those tweets generated a lot of retweets, indicating the appetite for information included an appreciation for social media aesthetics. In addition to the media coverage generated by the event, the PGPD advertised for “Game Time” in the days leading up to the game on Twitter, since that’s where the event would take place. However, to encourage crossover followers, the event was also advertised on the department’s Facebook page. What ticket holders and commuters alike took away from the “Game Time” experience isn’t easily measured. Based on media coverage, the 38 new @PGPDNews followers gained that day and positive response from existing @PGPDNews followers, the department deemed the event a success. The next similar event is planned for the week before Thanksgiving. Look for @PGPDNews to host #OperationOutlets on November 22, 2013. The grand opening for a new outlets mall in Prince George’s County is expected to draw more than 20,000 visitors and could lead to traffic tie-ups. To try and prevent that, the PGPD’s Special Operations Division’s Traffic Enforcement Unit and the Media Relations Division will again team up, returning to Twitter to once again keep citizens informed. Julie Parker serves as the Director of the Media Relations Division for the Prince George’s County (MD) Police Department, the nation’s 28th largest law enforcement agency. The PGPD straddles Washington, D.C. and spans 500 square miles of urban, suburban, and rural populations. Prince George’s County is home to the University of Maryland at College Park, the Washington Redskins, and NASA headquarters with an approximate population of 900,000. 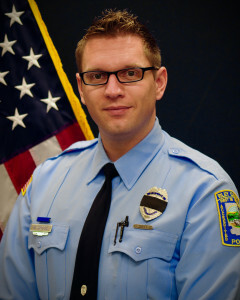 Parker serves as principal communications advisor to the Chief of Police & other executive command staff and is responsible for key messages and media strategy, to include during crisis situations. She promotes and achieves positive news stories at an unprecedented level for this police department. Parker manages a 13-person division comprised of sworn and civilian public information officers, video production specialists, graphic designer, Crime Solvers coordinator and special projects professional. Parker is also a frequent guest lecturer at the FBI National Academy on law enforcement media relations and crisis communications. She’s a recognized leader in using social media for innovative community outreach, media relations, crisis communications, targeted branding and messaging. Parker spent 13 years reporting and anchoring in Washington, DC, most recently for ABC7 News where she won both an Emmy Award and an Edward R. Murrow Award.